Complete your entertainment space with this modern console. 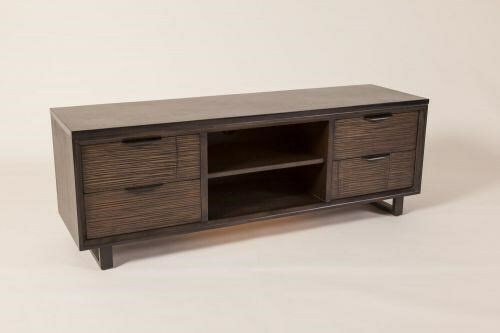 The TV table offers both open and concealed storage for your media consoles and accessories. Sleigh style legs and clean lines give the piece a modern look, while crushed bamboo drawer fronts and a Smoke finish on the Jemelina wood frame adds warm, rustic appeal. The Loft TV Table by C.S. Wo & Sons at C. S. Wo & Sons Hawaii in the Hawaii, Honolulu, Oahu, Hawaiian Islands, Waikiki, Diamond Head, East Honolulu area. Product availability may vary. Contact us for the most current availability on this product.